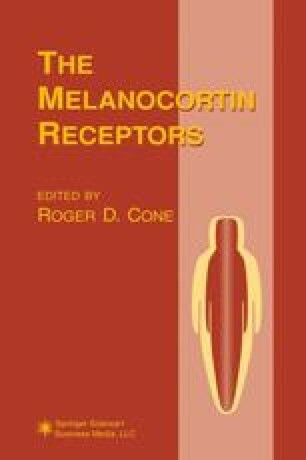 After cloning of the melanocyte MC1-R (1,2) and adrenocortical MC2-R (2),interest in the possibility of unique neural homologs of these receptors grew from observations of central effects of melanocortins, such as effects on learning and memory (reviewed in ref. 3) and temperature control (4). Furthermore, the in situ ligand binding experiments of Tatro had demonstrated the presence of high-affinity binding sites for (125I-NDP-MSH) in rat brain (5), and these as well as the physiologic experiments suggested these sites were encoded by pharmacologically distinct melanocortin receptors.